It's been another extremely productive year for cleftAdvocate and the Pathfinder Outreach Program. We are touching so many lives with our website at www.cleftadvocate.org, our on-line support listserv at the Family-to-Family Connection, and our Pathfinders, who reach out to families in their communities across this great country and beyond! It's been a big 2005 for the cleftAdvocate organization! In addition to receiving the Parent-Patient Leadership Award from the Cleft Palate Foundation (read acceptance speech here) and receiving the Jefferson Award ** in her hometown of Las Vegas, NV, cleftAdvocate founder Debbie Oliver will travel to New York to appear on the Montel Williams show on December 1, 2005 when the winners of Charming Shoppes' Voices 2005 Campaign will be announced. This will be an extremely rare opportunity to share information on clefts and other craniofacial conditions with a vast national audience, and a chance to let families know that we are here to support them with educational materials, friendship and love! 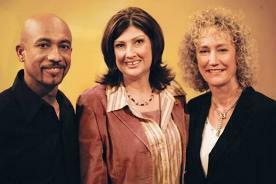 Learn more about the Voices Campaign and sponsors Charming Shoppes, Inc., and be sure to check your local listings and watch Montel on December 1, 2005! These awards are dedicated to each and every one of our network families and our fabulous volunteers, for without you, none of this would be possible! Thank you for your continued support of cleftAdvocate and the families we serve! Receive our Newsletter - Network Now! and Charming Shoppes, Inc. CEO Dorrit Bern. Voices 2005 is sponsored by Charming Shoppes! As seen on the Montel Williams Show!